Greece - The last of riots that shut down at least 11 prisons around the country was put down today four days after unrest broke out. The disturbances were sparked by the brutal beating of anarchist prisoner Giannis Dimitrakis at the hands of guards. Dimitrakis is being held on bank robbery charges and is awaiting trial. Anarchists who ideologically are opposed to prisons organized numerous solidarity demonstrations in Athens, Thessaloniki and outside some of the prisons to show their support of the inmates. 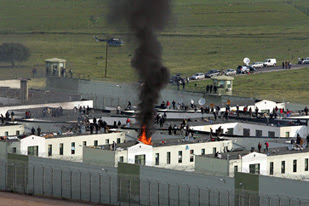 New Castle, Indiana - Hundreds of Arizona convicts angry about having been recently transferred nearly 2,000 miles from their home state to the privately owned and operated New Castle Correctional Facility refused orders, attacked guards and set fires during a riot Tuesday. Two employees of the facility were injured and required treatment. The disturbance was put down after about four hours but officials have decided to "permanently put on hold" additional transfers from Arizona.